Spend more time fishing and less time removing tangled hooks and fish. 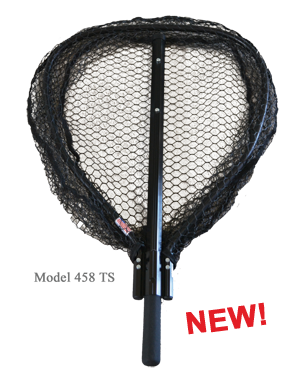 These special nets have many of the qualities of a rubber net without the extra weight! They also make the perfect catch-and-release net! The fish will calmly lay across the bottom while you remove the hook. The net features a knotless, hook-free rubber coated nylon flat bottom net. It has 3/4″ holes that create very little resistance in the water. Heavy-duty octagon handles automatically line up for quick extension and slide up into the hoop for easy storage. All hoops are made of heavy 5/8″ aluminum with reinforcements at all critical stress points. All handles and hoops are anodized black.